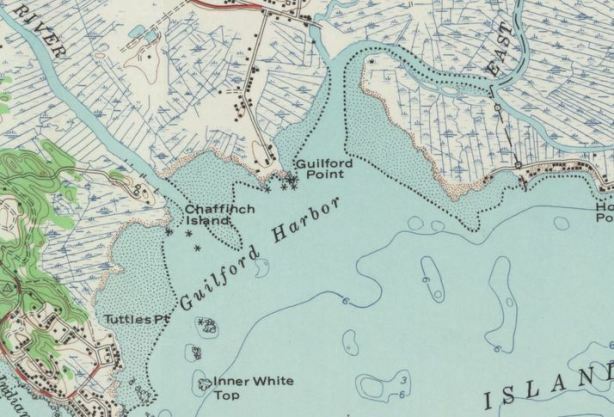 In the early decades of the 20th century, the town of Guilford had a fire department stationed on Chaffinch Island. Credited by the Chief of the New Haven Fire Department with having some of the best equipment found between New Haven and New London, the Chaffinch Island department ignored town borders to help extinguish fires all along Connecticut’s southern coast. What made these efforts so unique was that the entire Chaffinch Island Fire Department consisted of just one man, Francis E. Ingals, who fought fires out his home as a hobby. Ingals was a mechanical and electrical engineer who studied his craft at the University of Wisconsin. After going to work for an electric automobile plant in Chicago, Ingals bought a summer home on a lake in Wisconsin. One night while on the lake, a nearby hotel owned by one of his friends caught fire, and Ingals rushed to assist in saving the building. From then on, he knew he wanted to fight fires. 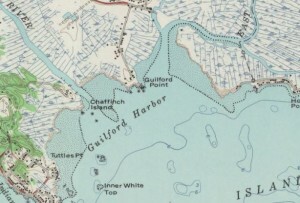 In the 1920s Ingals moved to Guilford with his mother and purchased a home on 8 acres of land on Chaffinch Island. After fixing up the house and constructing some outbuildings, Ingals realized that living in such an isolated location left his home susceptible to loss by fire. He began acquiring firefighting equipment. His first fire engine was a Ford Roadster that he modified with a place in the back for storing a reel of rubber hose and apparatus for pumping water or fire-suppressing chemicals. Once his neighbors learned about his fire truck, they asked if he might assist them in case their properties ever caught fire. Before long, Ingals found himself providing services to the entire town of Guilford and beyond. His fire station was his home. Alarms came via calls from local telephone operators. As the years passed, Ingals regularly expanded his garage space to house larger and larger trucks. 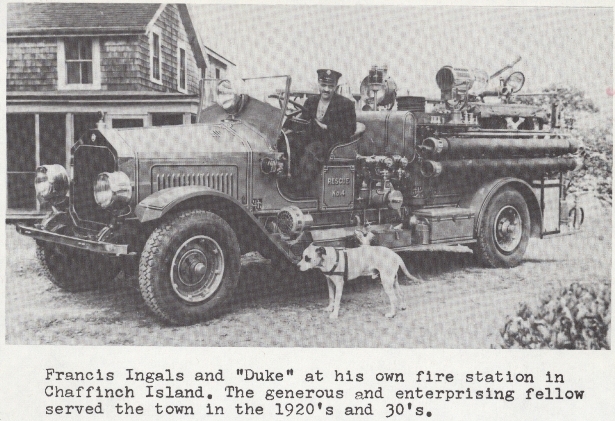 By 1931, Ingals had a Maxim pumper truck he outfitted with a special front seat to allow his dog Duke to ride along on calls. When not fighting fires, Ingals was a boat operator for Chaffinch Island and also worked as a handyman, repairing motors or fixing up boats for his neighbors. He used this money to help defray the personal expenses he acquired because of his firefighting hobby. In 1941, Ingals allegedly submitted a bill for $200 to the Guilford Board of Selectman for repairs to his equipment. When the town voted down his request for reimbursement, Ingals sold his truck and firefighting equipment to the town of Meriden, effectively ending his days as a one-man fire department. “Historical Room.” Guilford Free Library, 2012. Link.